Hardy but short-lived shrubs that produce cherry-like “drupes” in fall, the purple-leaf sand cherry (Prunus x cistena) will generally require very little pruning, but it does require regular pruning to keep its shape. The branches of sand cherry shrubs that are left to grow naturally without pruning eventually fall over, leaving the bush with an open center and an undesirable shape. As long as they are planted in full sun in well-drained soil, they are not fussy about the composition or pH of the soil in which they grow. Prune when transplanting. 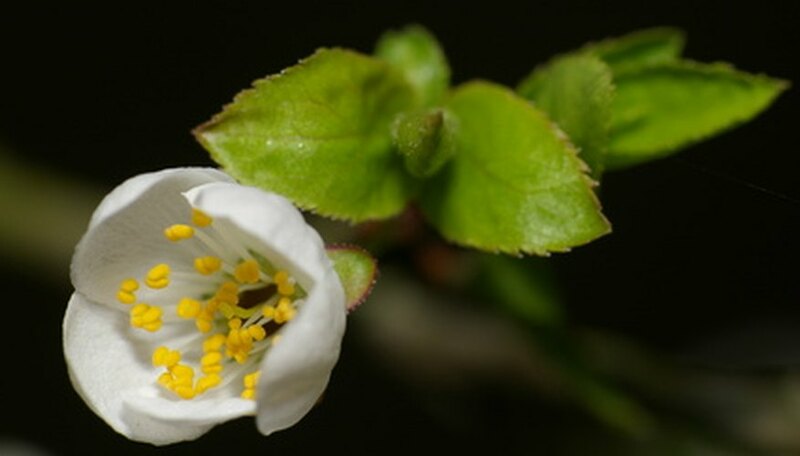 If you are transplanting a newly purchased bare root sand cherry, begin by pruning out any roots that are broken, diseased or growing in a circular pattern using the pruning clippers. For container-grown shrubs, omit this step. If you are planting a hedgerow of sand cherries, prune back each individual plant before planting, so it is about 6 inches high. Prune established sand cherry shrubs in early spring, before growth begins. Remove any dead, diseased or crossing branches by cutting them off as close to the base of the plant as possible. Use the pruning clippers on smaller branches and the pruning saw on larger branches. Cut out one-fourth to one-third of the thickest, most mature branches, making the cut near the base of the bush. Use the pruning clippers or the pruning saw on larger branches if they are too big to cut with the pruning clippers. This will open up the center of the bush and encourage it to produce new, vigorous-growing branches. Prune back the previous year's growth. Make the cut so that about 2 inches of the previous year's growth remains on the shrub. Prune just above an outward-facing bud, which will force the new branch to grow out from the center of the plant, creating a shrub with a center that is open enough to allow light and air to get to all of its branches. Rejuvenate a neglected or overgrown purple-leaf sand cherry by hard pruning all of its branches down to within 6 inches of the ground in late winter, before its initial spring growth spurt. Even with yearly pruning and careful cultivation, purple-leaf sand cherries become more susceptible to pests and diseases after they reach the age of 10 years and and begin to decline in health and vigor. The best solution is to remove the shrub and plant a new specimen.